Darren is a musician of rare versatility – a successful conductor, teacher, trombonist, outreach leader, vocalist, pianist, organist and accompanist. Darren’s musical career started in Cornwall at an early age. Having started learning the piano at the age of five, the trombone soon followed and it was with the Mount Charles Youth band that he gained considerable success over a period of seven golden years. Soon after, Darren accepted a position with the Bodmin Town Band and it was during this period that he won the West of England Regional Championships, West of England Bandsman’s Festival (Bugle), Yeovil Entertainment Contest, and competed in the National Brass Band Championships of Great Britain and Grand Shield Contests playing under some fine conductors in the shape of Dr Nicholas Childs, Dr Roy Newsome, Major Peter Parkes and Russell Gray to name but a few. 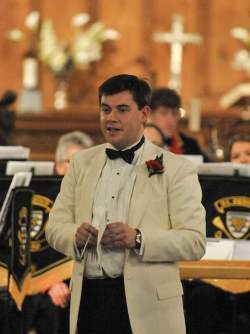 Darren also held the position of principal trombone with the Cornwall Youth Brass Band for five years, a tenure that brought him four awards including the Albert Chappell award for ‘Best Player’ on two occasions. In 2003, Darren left Cornwall to embark on a BMus (hons) degree at the Royal Welsh College of Music and Drama (RWCMD) under the tutorship of Dr Robert Childs, Christopher Mowat and Kevin Price. He has performed with the Symphony Orchestra, Brass Band and Brass Ensemble. During his studies, Darren was awarded second place in the annual Linda Mowat Brass Competition on two occasions. After successfully completing his undergraduate degree, Darren furthered his music studies at the college undertaking a postgraduate degree. It was during this time that Darren combined his trombone/conducting studies with the post of ‘Assistant to the Head of Brass’ and also held the position of ‘Vice-President’ on the college’s Student Union. Away from his college studies, Darren gained a sole invite to take up a conducting placement with one of the world’s leading Opera companies; the Welsh National Opera under the baton of world renowned conductor Carlo Rizzi. A trombone placement with the BBC National Orchestra of Wales soon followed in which he was also a core member of the BBC National Chorus of Wales today. It is during his time at the college that ‘Absolute Brass’ was formed, a brass quintet that regularly performed throughout the UK. 2007 saw Darren become a part-time member of Staff in the Junior Music and Access Studies department at the RWCMD where he was a lecturer, academic teacher and conductor in residence of various ensembles including the symphony orchestra. It was after this successful appointment that he was offered the full time position of ‘Outreach Co-ordinator’ in the senior college of the RWCMD, overseeing and implementing Outreach provision across all areas of the college. It was in 2005 that Darren was asked to make his brass band contest conducting debut at the age of 21 with the St.Breward Band at the South West Brass Band Association Annual Championships. It was on this, his winning debut that further invitations were to be received including conducting St.Pinnock at the National Brass Band Championships in 2006. After being in great demand, Darren continued freelancing conducting with various championships section brass bands, orchestras and choirs across the West of England and Wales. In 2009, Darren was delighted to accept an invitation by the St.Dennis Band to conduct the band at the 2009 West of England Bandsman’s Festival (WEBF) at Bugle in which the band were awarded second place. Further immediate success on the contest stage was to come with the Mount Charles Band conducting them to victory at both the Miller Countrywide Entertainment Contest and the Grenland International Brass Festival (Norway) in 2010. Since Darren’s appointment as the Professional Conductor of the St.Dennis Band in 2010, there have been many notable achievements. They include; a coveted Royal Trophy win in 2012 alongside no less than five second places at the WEBF, a third place at the Yeovil Entertainment Contest in 2014, second place at the Pontins Brass Band Championships in 2010, two top six results at the West of England Regional Championships and more recently, promotion from the Senior Trophy into the Senior Cup at the British Open Spring Festival in 2014. Alongside his conducting duties with the St.Dennis Band, Darren currently holds the position of Assistant Director of Music at Plymouth College, one of the leading Independent Schools in the South West of England and more recently, the appointment of Lead Conductor with the Cornwall Youth Brass Band (2015).